One of my favourite Shakespeare plays is The Winter’s Tale, and I have written music for three completely different productions during my time as Head of Music to the Royal Shakespeare Company. One, starring Judi Dench as both the mother, Hermione and her daughter, Perdita, had a big band Tribal Love-Rock score; another had a more classical, but timeless feel to it, and the last was an excellent small-scale touring production, for which I was allowed only a handful of instruments. It is from this source that the basic themes for Bohemian Dances, and an earlier version Three Dances for Clarinet Choir, have emerged. Act IV of the play is set in the kingdom of Bohemia – hence the title of the work. Shakespeare calls for “A Dance of Shepherds and Shepherdesses”, which gives Florizel, the son of Polixenes, (King of Bohemia) a chance to become better acquainted with the beautiful Perdita, the lost daughter of Leontes, (King of Sicilia). This movement is written in seemingly tricky and ever-changing metres, but is rhythmically quite logical and melodically catchy. The slower second movement ‘Florizel and Perdita’ is the lovers’ pas de deux: a gentle, slow waltz-like tune, initially presented by the principal oboe, is contrasted with a ländler-like double time melody, at the end of which a solo clarinet makes a link to the last movement. ‘Dance of the Satyrs’ is a rip-roaring, foot-stamping dance performed in the play by ‘three carters, three shepherds, three neat-herds, and three swine-herds’, who enter in outrageous costumes representing the lecherous half-man, half-goat of Greek mythology. This dance is referred to as a “gallimaufry of gambols” – now where have I heard that word before?! 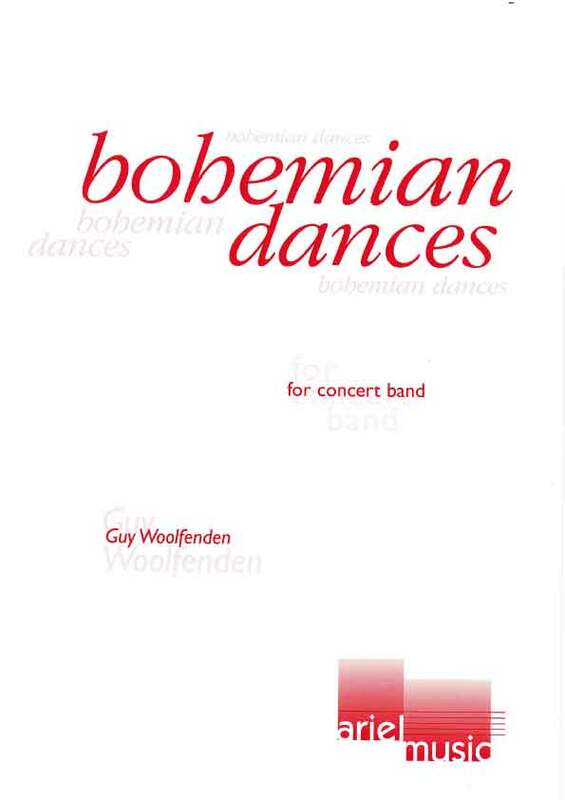 Bohemian Dances is a wonderful work by Guy Woolfenden that was composed in 2005. Graded as a 4, this nine minute work is typical of the composer’s works, well crafted and a joy to listen to as well as perform. The material for the piece is taken from Woolfenden’s score for a production of Shakespeare’s The Winter’s Tale……consisting of three movements, we heard the second and third. The second is Florizel and Perdita, which has a lyrical oboe solo with light accompaniment. The movement flows with such grace throughout. A clarinet cadenza leads without pause into the third movement, Dance of the Satyrs. The melodic ideas of this final movement primarily appear in the woodwinds, while the brass interject several points of dialogue. The technical passages seems to be very idiomatic for each instrument. Guy Woolfenden was the first composer I commissioned for BASBWE back in 1982….and happily he has been writing consistently for wind band ever since. His Bohemian Dances are charming, full of tunes and witticisms and well worth exploring alongside his Gallimaufry and Illyrian Dances. Short solo passages create many colourful melodic lines which characterise much of this work. The technical abilities required of each individual instrument are well within the performing range of excellent non-professional players. Bohemian Dances is a welcome addition to the repertoire of every wind ensemble.